As the years passed, Sani sent her two teenage sons to work as labourers simply to keep the family afloat. 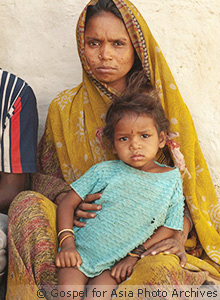 Because of their grave poverty, her children could not continue in their schooling. Even though she and her sons worked hard, the income they earned still did not build up their financial needs. But help would come, unexpectedly, from one of her neighbours. Though she found new life in the Lord, Sani and her sons still struggled for daily survival on the meagre earnings they laboured for. Sani experienced the love of Christ and His providing hand in a real and tangible way. 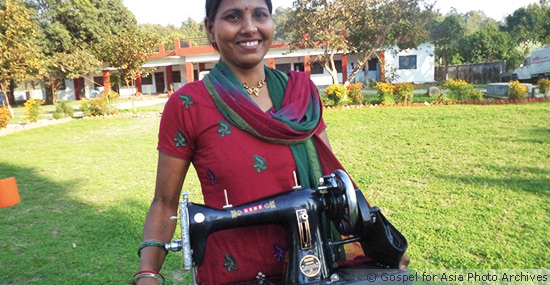 A simple sewing machine brought her hope and helped show her how much the Lord values her. Her life is just one testimony of hundreds who have received a gift from Gospel for Asia’s Christmas Gift Catalogue. Pastor Tomaza Victoria Ayala Zellero and her family were evicted from their home on the 22nd May 2009. She is part of the Apostolic Movement and pastors an Apostolic Church in Central Elia, Las Tunas province, Cuba. They were originally told that the house, which also served as their Church, would be confiscated in July 2008, despite the fact that Tomaza and her husband, Jorge, had lived there for almost 30 years and were the legal owners. When they were evicted the authorities gave them documents prohibiting Tomaza from holding any religious services and the police chief threatened to imprison her for ‘dangerousness’. Finally, the authorities also forcibly closed their carpentry shop, leaving the family homeless and depriving them of an income. Please pray for Tomaza and her family, that God gives them the strength to endure all the hardships from which they are presently suffering. I know that they would welcome all your letters and support to show that many people are thinking of them – and praying for them. Hansini steeled herself against the pain of another blow. Soon her body would turn all shades of black and blue, but her attacker wouldn’t be satisfied. He wasn’t simply angry like the others. This man was desperate. At 17 years old, Hansini had shamed the entire village by her actions, but everyone blamed him. Now he was determined to see his reputation restored—no matter the cost. Hansini’s village wasn’t much to look at. The people were poor and most struggled for daily survival. Still, they had some things to their credit: They were faithful to their traditional deities, and though their lifestyles wouldn’t suggest it, they belonged to highly distinguished clans. Between working as daily wage labourers and scraping together meals, the people still managed to look down on the lower castes. As if their status weren’t bad enough, many in the lower castes had deserted the traditional religion and begun following Jesus, making them even more disgraceful. Although most villagers wanted nothing to do with the low caste people, however, there were a few who had given up their reputation to join the Jesus-followers. To her family’s dismay, Hansini was one of them. From the beginning, Hansini’s parents, Badal and Deepti, strictly opposed her new faith, but their stance did little to calm the rest of the village. The teenager had brought scandal to their doors and something needed to be done. Old friends became hostile to the family, who received no end of scolding from neighbours and extended relatives. “You have let your children run so free that you cannot even make them obey you,” the village elders told them. It didn’t matter that their son and younger daughter still behaved respectably, or that Badal and Deepti worked hard every day. Their own beliefs were of no consequence because Hansini’s actions had overshadowed them all. The villagers were disgusted when the lower castes began following Jesus and meeting as a fellowship. One day, Badal couldn’t bear the humiliation any longer. Hammered by the scorn of his neighbours, the man snapped, and he beat Hansini with all the fury and shame he felt. But even as the dark bruises began to show, Hansini stood firm with a determination no one understood. When her brother and sister begged her to come back to their religion, she just told them more about Jesus and asked them to join her instead. The neighbours were disgusted, and the family could only wait helplessly for Hansini to relent and clear the family name. After three years passed, though, it seemed she never would. Despite the village’s protests, Hansini refused to give up her faith in Christ. One day, Hansini came home with a surprise from her church’s Christmas gift distribution program. It didn’t make sense that the poor, lowly believers could give such a nice gift, but the gleam of the new sewing machine was undeniable. Hansini didn’t waste any time in putting it to use. She began sewing and selling mosquito nets, and Badal and Deepti watched in amazement as their wayward daughter started earning a significant income. Rather than using it for her personal gain, she took care of her family’s bills. As they looked at what they’d received from the daughter and the God they rejected, Badal and Deepti realized how wrong they had been. Together, they decided that if Jesus could love them while they rejected Him, then they would serve Him no matter what the neighbours said. And as word spread of Hansini’s success, the neighbours had plenty to say. The sewing machine Hansini received from her church allowed her to support her whole family. Would Hansini teach their children to sew, too? The young woman happily agreed. Today, Hansini teaches classes six days a week, borrowing a second sewing machine from a fellow believer, and hopes to share the love of Jesus with her students. In the meantime, the villagers have stopped their hostile actions and some are even coming to church, eager to learn more about the longsuffering love of Christ. After seeing it clearly demonstrated through Hansini, it’s not so shameful anymore. A mysterious illness caused Kalapi’s body to shake uncontrollably. For two years, she had difficulties walking, eating and drinking. Eventually, she struggled even to speak. Her family sought aid but found none—until they heard about a local Christian congregation. Kalapi went to the church, which is led by Gospel for Asia-supported pastor Boro Rai, and received prayer. It was there that she finally found deliverance, thanks to Jesus. Pastor Boro began visiting Kalapi and her husband, Mudit, to tell them more about the God who healed her and to encourage them with promises from Scripture. During his visits, Pastor Boro noticed the bareness of their home, which contained only a few household items. But even more haunting was the thin, weak appearance of Kalapi’s children. Kalapi and Mudit could afford to feed them flatbread made of cornmeal, but that was about it. The lack of nutrition left the children vulnerable to frequent illnesses, and Kalapi and Mudit didn’t have the money to buy medicine for them. Pastor Boro couldn’t ignore the images he had seen of the near-empty home and the frail bodies of the children. Wanting to help, he spoke with his leaders and told them about the family’s need. When Pastor Boro visited Kalapi and Mudit, he noticed the bareness of their home and the thin, weak appearance of their children. Pastor Boro and his leaders decided to help meet the family’s basic needs by giving Kalapi and Mudit a gift. Pastor Boro told Kalapi the good news that the church was going to help her family, and he invited her to a Christmas gift distribution. Kalapi arrived on the appointed day. At the event, 20 pairs of goats, 24 cows, 25 water buffalo and several other useful items waited for Kalapi and other struggling families. Each gift, from a pair of tin sheets to a water buffalo, represented a helping hand from the Lord, who wanted these families to thrive. Pastor Boro told his leaders about his concerns for Kalapi’s family. Then, during a Christmas gift distribution, Kalapi received a cow and a calf! That day, Kalapi went home with a cow and a calf. With joy in her eyes, she thanked those who had made it possible for her to receive the gift. Now, because God put it on the church’s heart to give Kalapi a cow and calf, her family is enjoying a stability they desperately needed. The cow provides Kalapi’s children with milk, a source of protein that has helped their bodies grow stronger. In addition, Kalapi and Mudit have been able to use the cow’s dung to fertilize their crops, and when the calf grows up, they plan to use it to plow their fields. These Christmas gifts not only helped the family’s financial condition, but they also showed Kalapi how much God and His children care for her family. 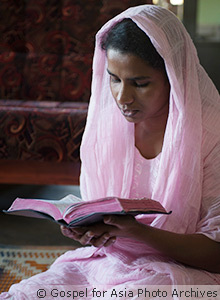 Seeing God’s compassion on her family, Kalapi’s faith grew. She prays to Jesus to meet her family’s needs, trusting in Him to provide. God has used the gift of a cow to sustain Kalapi’s family. Kalapi’s children have grown stronger and healthier by drinking the cow’s milk. By providing gifts from Gospel for Asia’s Christmas Gift Catalog, you can help bring stability and hope to families like Kalapi’s as you give them a source of income and sustenance. More importantly, you will be part of a tangible illustration of God’s great love for them. Families all over South Asia didn’t receive perfume or ties last Christmas. Instead, they received gifts that changed their lives. Pranjal had no way of providing medical treatment for his ailing wife, Sukthi. A witch doctor told them she should have surgery to fix her decaying rib, but the cost of the operation was more than Pranjal could afford. As a day labourer, Pranjal barely made enough to feed his family. In desperation, he went to the local Gospel for Asia-supported church and asked for financial help. But Pranjal received something even better than money. Instead of the church giving him money that could only temporarily fix what would be a prolonged problem, they gave him a cycle rickshaw so he could earn an income, provide for his family and get the medical treatments his wife needed. 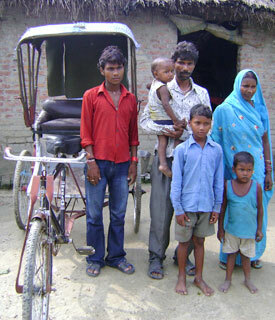 Pranjal was given a new cycle rickshaw. Now he can earn enough money to provide for his wife and four children. The local GFA-supported pastor also began visiting the family and prayed for Sukthi’s healing. A few months after receiving the gift, Pranjal took his wife to the hospital for a check up. Miraculously, the doctors told them regular medicine could help cure Sukthi’s sickness and no surgery was needed. Pranjal and his wife knew it was the Lord Jesus working in their lives. Surviving was tough for Mahir and his family. He was scarcely able to provide for his family’s needs because he wasn’t able to find a job. However, GFA-supported pastors in the area took notice of his great need. They invited Mahir and his family to attend their Christmas gift distribution program, and to Mahir’s surprise, he was gifted with carpentry tools. Even though Mahir had no experience or knowledge in carpentry work, he began doing small repair jobs in his village. Slowly, his carpentry skills developed to the point where he was able to build furniture and even houses. Now, through this gift, Mahir is able to earn 1,500-2,000 rupees ($30-$40 US) a month, which is enough for him to take care of his family. Shikar and his family were constantly getting sick from the water sources in their village. Shikar and his family suffered with stomach problems, jaundice, typhoid and diarrhea. And because necessity compelled them to use ponds, rivers and contaminated well water for bathing, they also suffered from skin infections. The doctors told them they needed to use a water filter, but Shikar couldn’t afford to buy one. Fortunately, GFA-supported pastors provided for this need by giving Shikar a BioSand water filter from the Gospel for Asia Christmas Gift Catalogue. Now he, his family and even other people in his village don’t have to worry about getting sick. 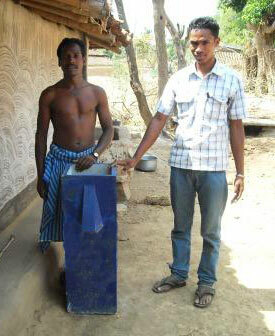 This BioSand water filter helped keep Shikar and other villagers safe from waterborne diseases. Sunlight filtered through a hole in the ceiling onto the back of a teenaged boy who had too many chores to do. The boy, Digvastra, longed to be at church, joining the saints for Sunday worship, but his father had given him a long list of chores to complete by sunset. Digvastra’s father, Hemendu, had decided he could stamp out his son’s new faith by preventing him from going to church. Hemendu gave his son a long list of chores each Sunday to stop him from going to church, hoping to snuff out the flame of faith growing in Digvastra’s heart. When Digvastra had put his trust in Jesus and had started going to the local church meetings, Hemendu became furious. He chided Digvastra, telling him not to go out on Sunday mornings, but Digvastra would sneak out. Then Hemendu decided to start giving Digvastra a long list of chores each Sunday morning to stop his son from attending church. Digvastra, still a teenager, honoured his father by doing as he was told. Chandira and Yahvi, two Gospel for Asia-supported women missionaries who had shared Christ’s love with Digvastra, befriended Digvastra’s family and had opportunities to tell Hemendu about Jesus. Gradually, Hemendu’s heart grew curious about the new faith, but he was not yet willing to risk the scorn his neighbours and relatives would heap on him for believing in Jesus. Two women missionaries, Chandira and Yahvi, shared with Hemendu about Christ. He became curious, but he still wasn’t ready to believe in Jesus. Digvastra kept praying to God to speak to his father, and Chandira and Yahvi prayed about a way to bless Digvastra’s family and show Christ’s love to them. The two missionaries felt the Lord was leading them to give the family a gift in their next Christmas gift distribution, but there was one problem: They didn’t know what to give them. Then, one day, Digvastra shared a prayer request with Yahvi and Chandira. He explained that the roof of his family’s house had a hole and needed a major repair. Digvastra knew his family desperately needed financial provision to fix the leaky roof. Amazed by and grateful for God’s clear direction, Yahvi and Chandira knew what to do. They put in a request to their leaders, and when the day of the Christmas gift distribution came, they were able to give Digvastra some tin roofing sheets! Digvastra asked Chandira and Yahvi to pray that his family’s roof would get repaired. 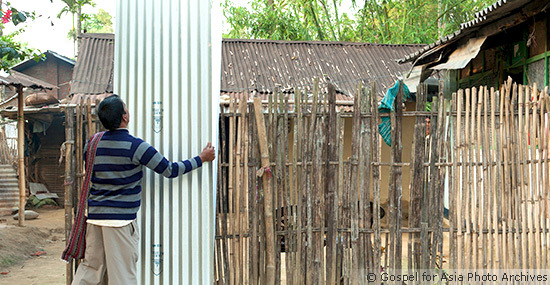 Soon, the young man received tin roof sheets through the Christmas gift distribution program! Overcome by God’s love and goodness, Digvastra could find no words to express his gratitude for the gift that his family had desperately needed. “God is good to us, and I know that, but it is hard for me. … I need time,” Hemendu replied. Even though Hemendu still wasn’t ready to put his trust in Jesus, the gift—a gift that would protect his family from inclement weather for years—impacted him. He was grateful to God for knowing his family’s needs and using the Church to meet those needs. Hemendu’s attitude toward Jesus and His followers completely changed. Instead of opposing his son’s faith, Hemendu became supportive. Digvastra can now spend his Sunday mornings worshipping with the local congregation instead of doing chores.